You may have read details about Mukesh Ambani’s new house-in-the-making at Altamount Road, but even as work on its construction goes on in full swing, here on your right is the first picture of what it will look like when it’s complete. 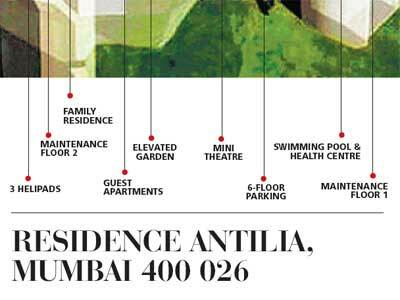 Mumbai Mirror is in possession of the entire architectural plan for Residence Antilia (as the house is going to be called, after a mythical island), the subject of enormous curiosity in the city ever since the Reliance Industries Ltd chairman purchased the 4,532 sq mt plot in 2002. The plan, drawn up by the firm Perkins+Will, reveals that the house will resemble a virtual glass palace, with entertainment centres, a health club, a swimming pool and various green spots thrown in for good measure. C onstruction of Mukesh Ambani’s new house at Altamount Road, where real estate prices are now in the region of Rs 75,000 per sq ft, began in late 2006, and the first six floors are already in place now. The building is expected to be complete in September 2008. According to the plan, the house will rise to a height of 173.12 meters, equivalent to that of a regular 60-storeyed residential building. However, Antilia will have only 27 storeys in all, which means each floor will have a ceiling considerably higher than the current average of nearly three meters. The first six floors — which have come up — will be reserved for parking alone, and that too for cars belonging only to Mukesh’s family. Space for a total of 168 ‘imported’ cars has been earmarked here. Sources said the Ambanis would prefer to have all their cars serviced and maintained at an in-house service centre. This centre will be set up on the seventh floor. The eighth floor will have an entertainment centre comprising a mini-theatre with a seating capacity of 50. The rooftop of the mini-theatre will serve as a garden, and immediately above that, three more balconies with terrace gardens will be independent floors. While the ninth floor will a ‘refuge’ floor — meant to be used for rescue in emergencies — two floors above that will be set aside for ‘health.’ One of these will have facilities for athletics and a swimming pool, while the other will have a health club complete with the latest gym equipment. 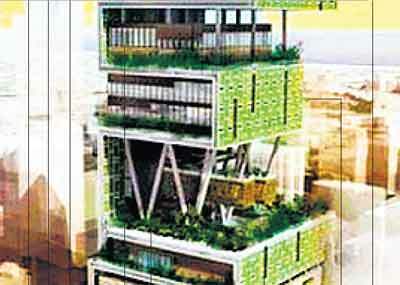 There will be a two-storeyed glass-fronted apartment for the Ambani family’s guests above the health floors. One more refuge floor and one floor for mechanical works will be built on top of these apartments. The four floors at the top, that will provide a view of the Arabian Sea and a superb view of the city’s skyline, will be for Mukesh, his wife Neeta, their three children and Mukesh’s mother Kokilaben. According to the plan, two floors above the family’s residence will be set aside as maintenance areas, and on top of that will be an “air space floor,” which will act as a control room for helicopters landing on the helipad above. The plan states that three helipads are to be built on the terrace. However, Brihanmumbai Municipal Corporation officials told this paper that permission for the helipads has not been granted yet. “The residential plans were approved three-four years ago. 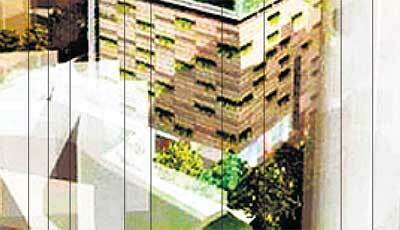 Two levels of basement have also been shown in the proposed project,” Sudhir Shinde, deputy engineer at the BMC’s building proposals department said. Nearly 600 staffers are expected to work full-time in the building, sources said. 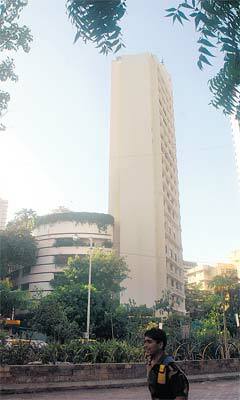 According to BMC records, the total area of Mukesh’s Altamount Road plot is 4,532.39 square meters. The proposed built-up area is 4,778.09 square meters (only for residential purposes), and the permissible built-up area 4,939.81 square meters. Antilia (or Antillia) is a phantom island said to lie in the Atlantic Ocean far to the west of Spain. This mythical island had several other names such as Isle of Seven Cities, Ilha das Sete Cidades (Portuguese), Septe Cidades, Sanbrandan (or St Brendan), etc. Antilia was also identified with islands including the Isles of the Blest and the Fortunate Islands. The origin of the name is uncertain. The oldest suggested etymology (1455) fancifully connects it with the name of the Platonic Atlantis, while later writers have endeavoured to derive it from the Latin anterior (i.e. the island that is reached “before” Cipango), or from the Jezirat al Tennyn, “Dragon’s Isle,” of the Arabian geographers. The legend of the islands seems to have arisen at the latest in pre-Christian Roman times when Plutarch chronicled (in 74 AD) the life of Roman military commander and Consul of Spain Quintus Sertorius (died 75 BC). After returning by sea to Spain after a campaign in “Mauretania” (modern northern Morocco), Sertorius “met some sailors who had recently come back from the Atlantic Islands.” It was from these men that Sertorius learned facts so beguiling that he made it his life’s ambition to find the islands and retire there.